Since the beginning, the CGI published its yearly Newsletter. 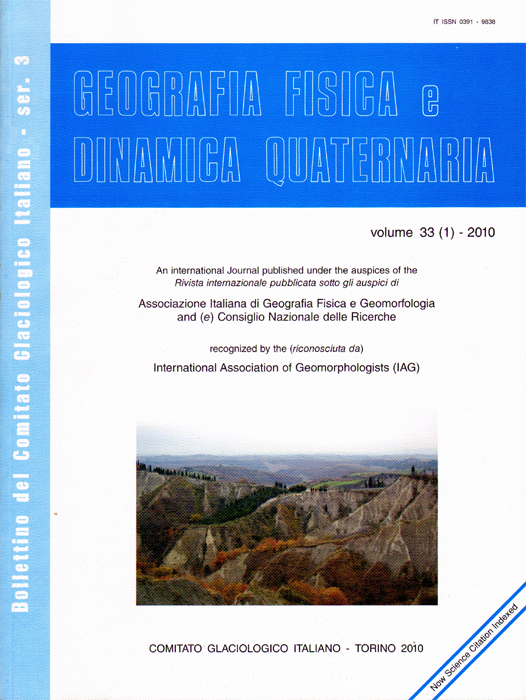 In the course of the years, the periodical (that since 1978 was converted into “Geografia Fisica e dinamica Quaternaria”) became a scientific journal of international relevance, frequently hosting international contributions. Yet, it was still the official journal where scientific, associative and field activities directly related to CGI were published. 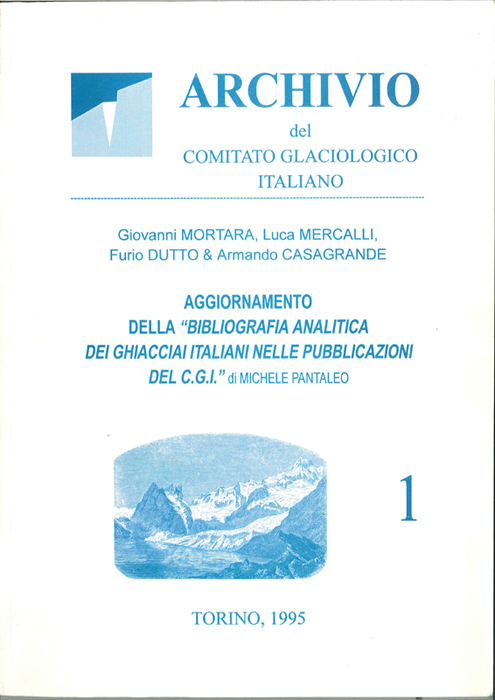 The literature also includes monographs dedicated to Italian glaciers. The journal is edited by the CGI under the patronage of the National Research Council. It was founded in 1978 and represents the continuation of the CGI Newsletter. The journal publishes memories and original notes, reviews, letters, and news in the field of physical geography, glaciology, geomorphology and Quaternary geology. Furthermore, it also publishes the official CGI proceedings, the newsletters and the reports of the International Association of Geomorphologists (I.A.G.) and the reports of the annual glaciological campaigns. 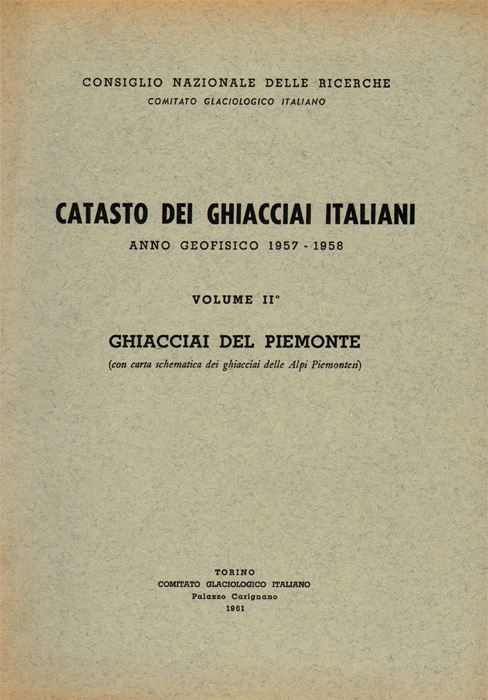 Since 1988, some thematic volumes called Supplementi di Geografia Fisica e Dinamica Quaternaria were also published. These volumes host papers dedicated to specific arguments, conference proceedings, symposia and regional monographs. 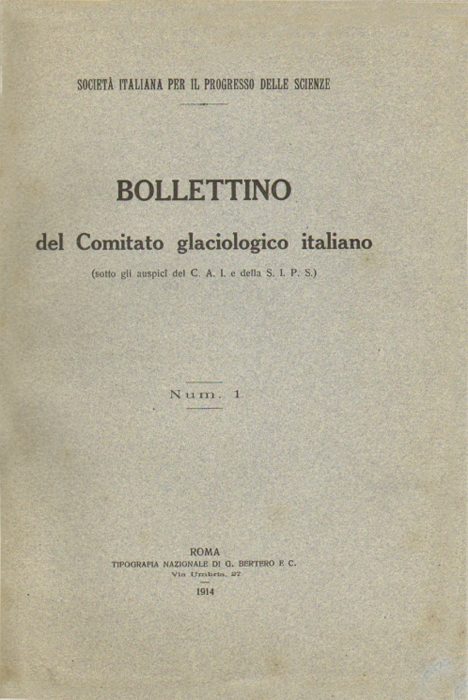 The publication of the CGI Bulletin, which is of major interest for the description and the study of glaciers, started in 1914 under the auspices of the Italian society for the advancement of science (SIPS) and of the Italian alpine club (CAI). Since 1937, on the other hand, the publication occurred under the patronage of the National Research Council (CNR). 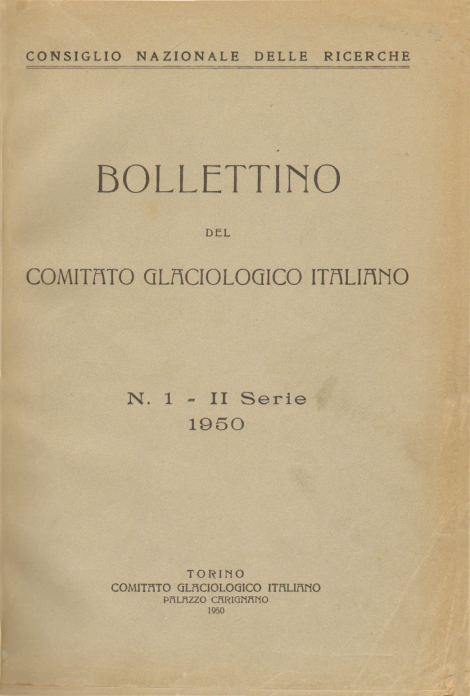 The name of the newsletter was kept the same, “Bollettino del Comitato Glaciologico Italiano”. 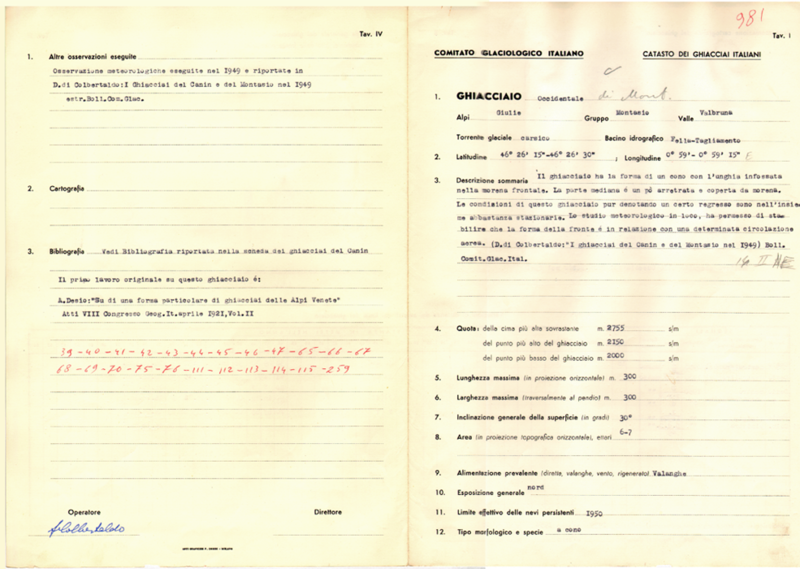 Only between 1933 (n.13) and 1945 (n.23) it changed into “Bollettino del Comitato Glaciologico e della Commissione Glaciologica del CAI”. The 50 first issues are grouped in two series composed by 25 issues. 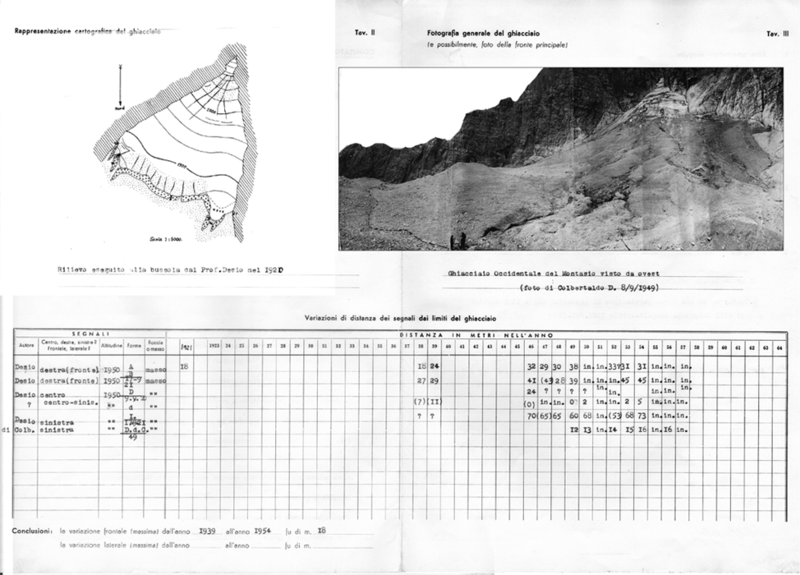 The CGI, since the beginning of its activity (1914) highlighted the need to create an “inventory of Italian glaciers, in order to provide an idea of our glacial patrimony and to secure an organic base for the study of our glaciers”. 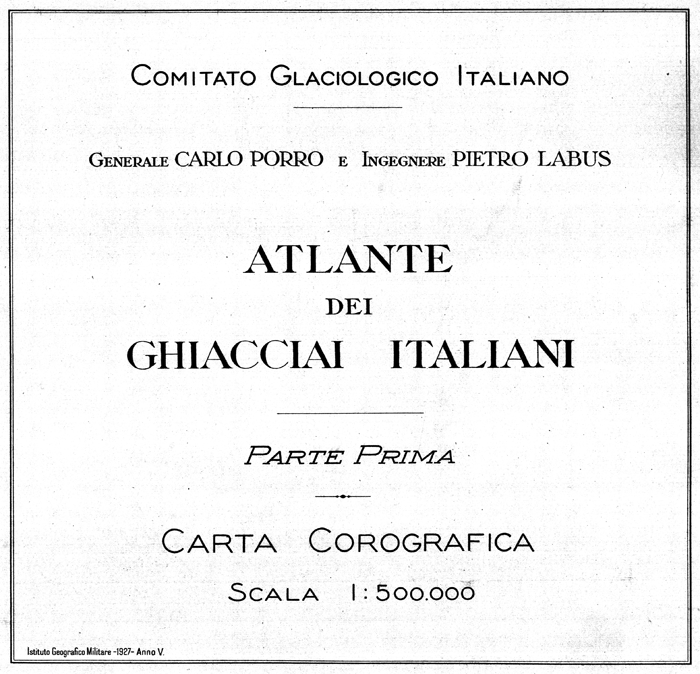 1927 – The CGI, in collaboration with the Military Geographic Institute (Istituto Geografico Militare, IGM), publishes the firs part of the Atlas of Italian glaciers, edited by Carlo PORRO and Francesco LABIUS. It consists of four charts (1:500.000) where 55 alpine and Apennine mountain groups holding glaciers are recognized. A second part of the Atlas holding a series of charts drawn to a scale of 1:25.000 and higher was announced, but it was never realized. This work results from collaboration between CGI and the National Research Council (CNR). 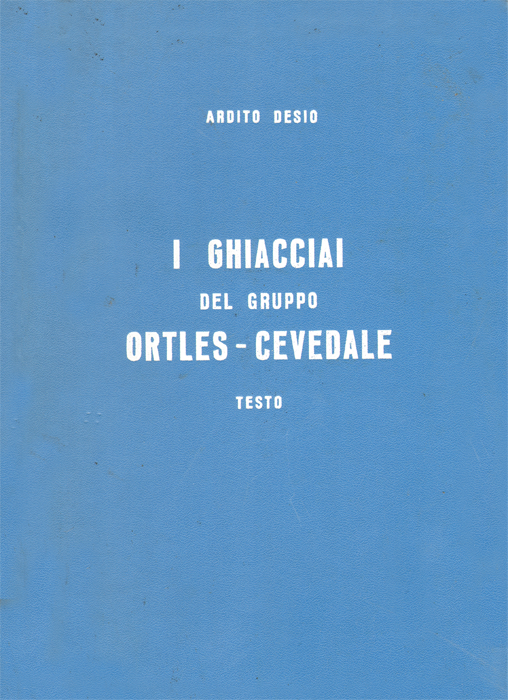 It was published in four volumes between 1959 and 1962, under the scientific coordination of GIUSEPPE NANGERONI. 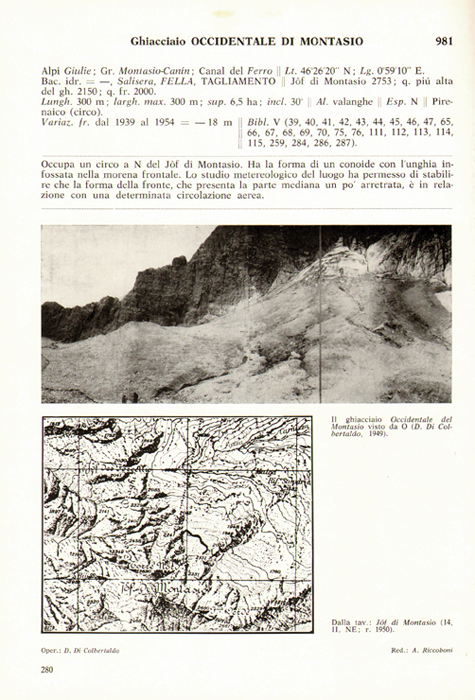 Volume IV – Glaciers for the Tre Venezie area and from the Apennines (1962); pp. XXVII-309; 306 tables; 207 pictures. The CGI archive preserves part of the original charts filled by the operators for the realization of the Inventory 1959-1962. – Voume II – Tables; 387 pictures and a large chart in colour (1968). 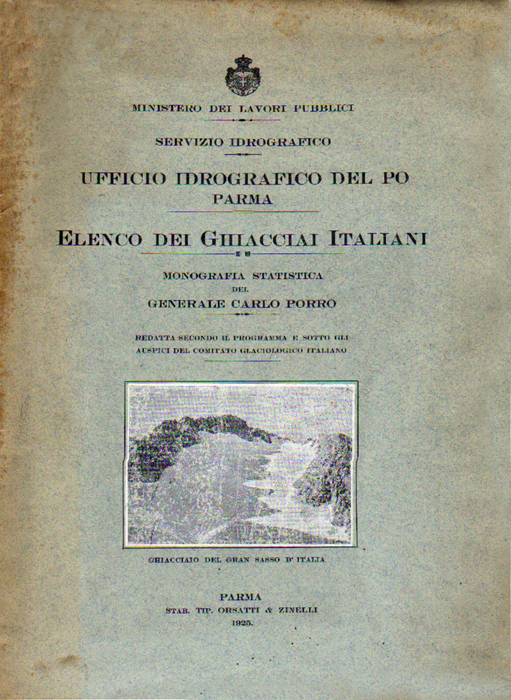 In the series “Collana di pubblicazioni presentate dall’Italia come contributo al Decennio Idrologico Internazionale” there is also a bilingual synthesis of Ardito Desio monograph, integrated with contributions from S. BELLONI, A. GIORCELLI e G. ZANON, edited by the National Research Council (CNR). 1973, pp. 107 PDF). The series, set up in 1995, makes available to people interested in glaciological research some scientific material hold by the CGI, organized in monographic volumes. 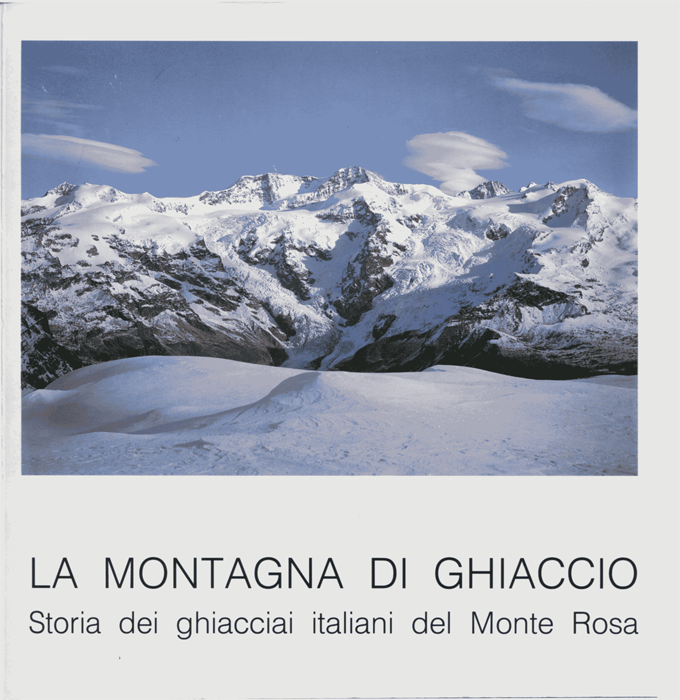 Catalogue in three languages related to the exposition realized by the Walser Kulturzentrum and by the CGI in Gressoney St. Jean in 1991 in concomitance with the 6th Italian Glaciological Congress (expositive project: L. MERCALLI; texts: A. BIANCOTTI and A.V. CERUTTI). pp. 79.